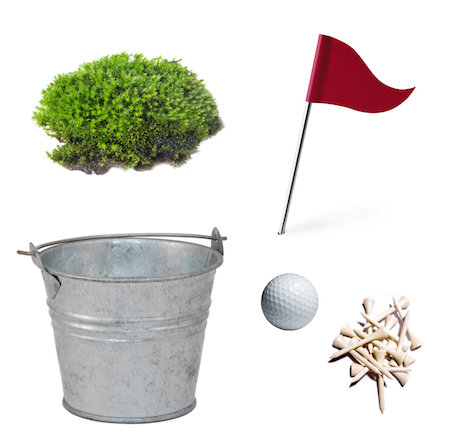 Make fun golf tournament centerpieces your guests will love! The key to a great centerpiece is to have it be creative, and also serve a purpose. Table numbers and candles are great ways to give “purpose” to your centerpieces, while still having them be cute. Your tournament participants will want to take these decorations home at the end of the night! Here are some golf-themed centerpiece ideas to really make your dinner tables or cocktail tables pop! Fill a glass vase with decorative sand, and a few fake greens from your local craft store. Then add either a golf ball or a flag stake with a table number into the sand. Simple! Layer two table runners down the length of the table in two complementing shades of green – one should be skinnier than the other in order to show off the bottom layer. Alternatively, instead of using the runner as a flat piece of fabric, scrunch and bunch it along the table to be sloping and decorate with white confetti or golf-themed confetti. Use a green tablecloth to represent the putting green, and then place a clear fishbowl filled with golf balls in the center. Stick a flag with a table number in the top and cover the top of the fishbowl with either moss or flowers. Yellow, white, and green are great basic flower colors, but feel free to use any event-specific colored flowers instead! In a tall and skinny clear vase, add a small layer of rocks and then fill the vase with water. Toss in a golf ball so that it sinks to the bottom and throw in a tee or two if you’d like something extra. Add a floating candle on top to make it classy! If you don’t have room in the middle of your table for a centerpiece due to shared food, games, etc., you don’t have to sacrifice a chance for cute décor. 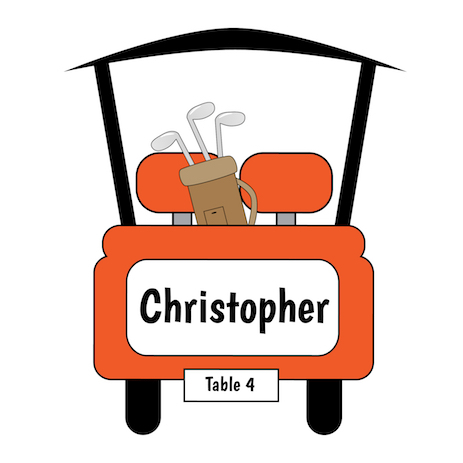 Instead, use tan or green napkins and order printed golf carts as guest cards for each seat. Tie a “golf cart” to each napkin or use napkin rings and rest the carts on top of each plate!